Separate solutions for migration, archiving and discovery drive up costs, interfere with deadlines and can destabilize the system as more vendors get involved. 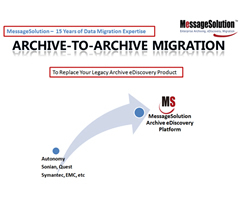 MessageSolution takes the 1-vendor approach for end-to-end project management through the data migration, content archiving, data offloading, and legal discovery processes. 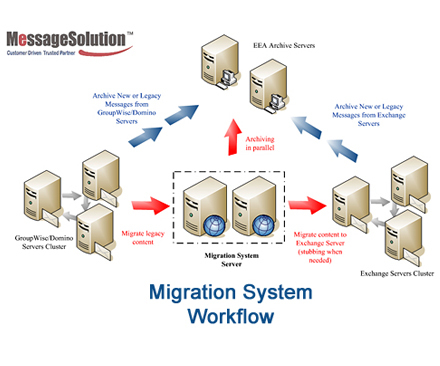 Migrate data from on-premise Exchange, GroupWise, etc. to hosted email platforms like Office 365. Instead of going directly to the cloud with all say 100 GBs of data. MessageSolution stubs large attachments as we migrate so there’s actually less data going into the cloud. “Leading” information archiving vendors purposefully make data extraction an extremely expensive and time consuming process. 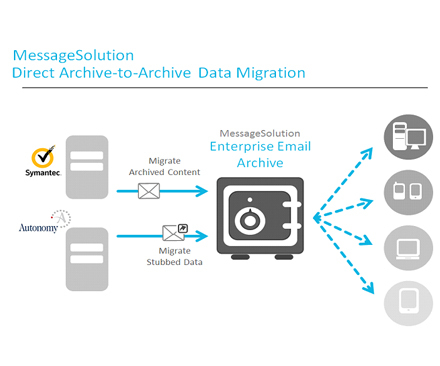 Securely and cost-effectively migrate data from Symantec EnterpriseVault, HP Autonomy EAS, and other legacy archiving systems. 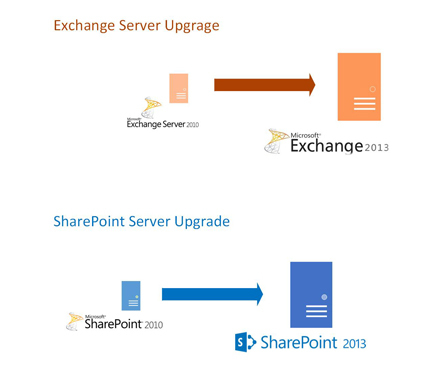 Migrate contents from one email, file or SharePoint server to another and across (i.e. GroupWise to Exchange server). Upgrade outdated servers (i.e. from Exchange 2007 to 2013.) with no change in the MessageSolution user experience.